Welcome - ThaiTicket.de offer Ko Samui hotels and resorts guide, discount hotels with secure reservation in South Thailand! Ko Samui hotel booking accommodation from 11 € Chaweng Beach, € 8 Lamai Beach, 9 € Bophut Beach. Choose your Ko Samui Hotel or Bungalow Resort from the list below to access the desired hotel page. You can choose from many beautiful palm beaches. The most beautiful beaches on Koh Samui are Chaweng, Lamai, Bo Phut, Mae Nam and the Big Buddha Beach. Shady palms, white sand and snow all year round 28 ° C hot water await the tourists. In the midst of the Southeast Asian tropics, is the climate on the island of Koh Samui moist and changeable. The journey is by bus or train on Bangkok-Chumphon/Suratthani and then by boat, ferry possible. Or you can travel by plane from Bangkok, Phuket or Pattaya to. 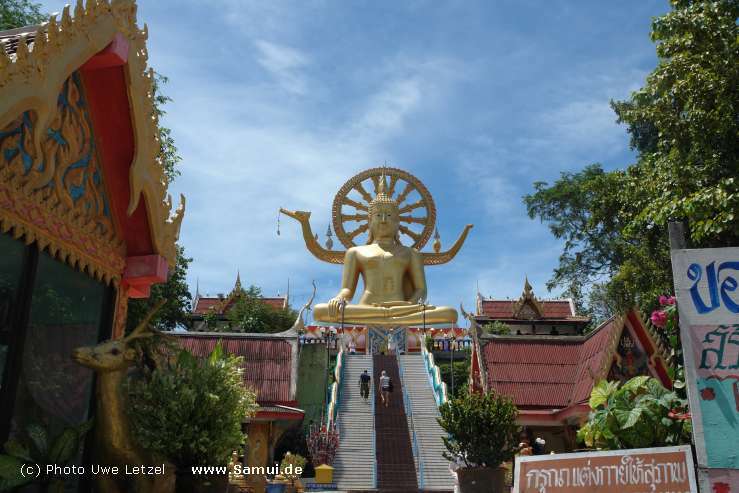 More information about the journey with timetables for flight, train and bus links here Koh Samui is the third largest island of Thailand after Phuket and Koh Chang to the visitor today is much more to offer than its exotic holiday flair. The island has since the mid-90s developed a fascinating holiday destination. At all beaches you will find lots of Thai and international restaurants, affordable resorts and chalet villages, and especially on Chaweng and Lamai Beach also offers first-class hotels as well as countless opportunities for entertainment by day and night. Koh Samui, with its magnificent mountain landscape invites you to extensive mountain tours to the waterfalls and unique attractions around the island. For a tour with a rental car available anywhere or motorcycle, you discover the other side of the adventurous coastal road beside Buddhist temples, elephant and crocodile shows picturesque coves and secluded romantic places. In the local travel agents on Koh Samui will be trekking tours, fishing trips and excursions to neighboring islands in the Samui Archipelago (Muu Ko Samui), to which about 60 other Islands, including Ko Phangan, Ko Tao, Ko Nang Yuan, Ko Taen and around 40 islands of the Ang Thong National Park-organized. The beaches of Koh Samui are quite different in character, in the follow resort pages you find is a brief description. The 5-Star hotel Anantara Lawana Resort & Spa is a contemporary Sino-Thai style resort. Located at North of Chaweng Beach, Koh Samui, Thailand. Set amongst a beautiful and luxurious tropical beach, 6 kilometers from Samui International Airport, 20 kilometers from downtown Nathon and its Ferry Pier. Whether in one of the resort's luxuriously appointed rooms or spacious pool villas, take in the fresh breeze off the bay and feel yourself relax. This exquisite privacy extends to the resort's signature dining experience, set in the tree tops in a private sala that overlooks the sea at Sky Hug. Though it might be tempting never to leave the resort, buzzing excitement and seaside charm are just around the corner in central Chaweng, a stretch of beach known for its bustling villages filled with local colour and even touches of international cosmopolitan flair. At Anantara Lawana, experience the best that this diverse and gorgeous island has to offer. Let a cool sea breeze welcome you to the island as you stand on a private balcony to survey your own corner of paradise. After taking in views of the sparkling bay or a lush tropical garden, retreat into the 60 spacious square metres of the bedroom and bathroom, including a romantic oversized soaking tub. Here you can book on the beautiful beaches accommodations in Koh Samui hotels or bungalows for an excellent price direct in Thailand.